← Thatcher and the British Military: A Champion of the Armed Forces? Please forgive the length of this post but there are some fairly complicated issues at work. As always comments are welcome! As part of the drive to improve training, and from 1941 new recruits still stationed in England were taught the new battle drill. The main aim of this was ‘infusing some of the realities of the modern battlefield into what many discerning commanders call the outworn pageantry of the parade ground.’ Officers and men embarked upon several exercises, including an assault course in full kit with loaded weapons. According to the desires for realism, live ammunition was fired at and around recruits as they went through manoeuvres for the first time. Firing live ammunition over the heads of trainees encouraged them to keep their heads down, and to keep themselves concealed. Another exercise was the ‘haunted-house’, designed to teach house-to-house fighting. A party of recruits was despatched with loaded weapons and live ammunition into a building filled with smoke as to reduce visibility. Figure targets of Germans popped up at the small squads of men as they made their way through the dim interior of the building, the object being to test reactions and fire-control, as it would be more than possible to hit an accompanying squad-mate in the confusion. These exercises were effectively drill under fire and duress, the exact conditions the soldiers would face in combat, and tested their skill and endurance levels, as well as creating a greater sense of comradeship. The desire for realism also gave rise to the Divisional Battle Schools, set up by Lieutenant General Paget, Commander-in-Chief of Home Forces, in early 1942. However, rather than the individual soldiers who learnt the new battle drill, it was regimental leaders who went to divisional battle schools. They would then instruct those under their command with what they had learned, ‘for it is for the students to return to their units and spread the gospel.’ While this was the same, previously maligned, method as had been in place during the inter-war period, it was believed that now the students were being taught the correct message, it was an appropriate form of ensuring that the Army adopted that message at all levels. However, there was the potential for serious problems as no two schools were alike in their ‘personality and methods’ for teaching battle drill. However, the new battle drill and Battle Schools obviously failed to revolutionise the Army immediately. When Brigadier Money attended a Battle School with several, though significantly not all, companies of his brigade, he found that ‘throughout the first camp and at the commencement of the second… an atmosphere of urgency, determination and reality was absent.’ Furthermore, the lessons of the Battle Schools were available only for those divisions fortunate enough to still be in Britain. Those on active service overseas persevered in their outdated, and inferior, training techniques. For Neil McCullum, fighting with the Eighth Army in North Africa, his training between combat comprised of re-learning petty drill such as correct posture when talking to superiors, or the correct way to fold a blanket, and ultimately surrendering the individuality the soldiers had lost at basic training but regained in combat. Similarly, the War Diary of the 6th Battalion, Durham Light Infantry, contains the ‘Training Programme for Week Ending 10th January 1942’ when it was stationed in Palestine, which reveals the predominance of ‘digging.’ For all four rifle companies, miscellaneous, unspecified digging was the primary training activity, interspersed with a few live action exercises, such as field firing for the mortar platoon and ‘mountain warfare’ for the rifle companies. That the ‘Training Programme for Week Ending 18th January 1942’ was exactly the same suggests this was the normal course of events. 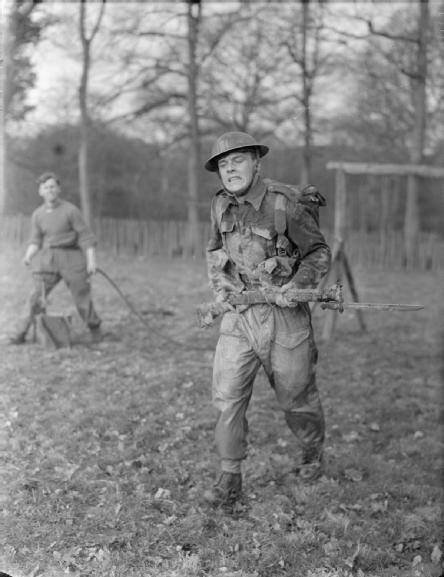 While it would no doubt have been difficult to impart the lessons of the new battle drill to troops already overseas, the contrast between the lessons learnt at Battle Schools and those in Palestine with the 6th DLI demonstrates a marked change in how the Army approached infantry training in 1941-2. It would be easy to dismiss Armour as an over-eager and bloodthirsty armchair general, but he was not alone. Indeed, Edward Hulton, owner of the Picture Post founded his own Home Guard School at Osterley Park, with the co-operation of the landowner Lord Jersey, as early as July 1940 in order to train the Home Guard in irregular warfare. It was early September 1940 when the War Office recognised the value of such a school and took over its running. In defence of Osterley and the philosophy of warfare it taught, Tom Wintringham, one of its ‘instructors’, wrote, shortly before the War Office took over the school, that ‘any weapon is good enough to kill Germans with, if you know its value and limitations,’ and called for the Home Guard to be enlarged to four million men by 1941. It is easy to understand the extreme views put across by both Armour and Wintringham; when they wrote, Britain faced the threat of invasion, where any man who could would be called upon to try and repel the Nazi invader. The extreme consequences of a successful Nazi landing in Britain called forth extreme means to repel them, something Armour and Wintringham advocated teaching from an early stage. Thus, the British Army struggled enormously with how best to prepare their men for combat. But was blood and hate training truly ridiculous? It ‘surely sprang from the fear that troops were being given no real preparation for the horrors of the battlefield.’ It was an extreme reaction to the under prepared and inadequate nature of pre-war training. The desire to create realism provided an image of war so distasteful, so accurate, that Whitehall superiors felt seriously threatened that the men of the British Army were becoming similar to their German enemy in more than one way; they were at risk of taking on the ‘cold, diagrammatic, pedantic, unimaginative, and thoroughly sinister’ nature with which the German soldier was described; he was human, whereas the Japanese were ‘animals of an especially dwarfish but vicious species’, but a perverse type of humanity. Bernard Law Montgomery of Alamein, The Memoirs of Field Marshal Montgomery (London, 1958), p. 119. PRO WO 201/2590 Major-General J. S. Nicols, ‘State of Training of Reinforcements’, 21 September 1942. IWM 72/14/1 Papers of Brigadier H. D. K. Money, ‘Lessons from Training Camps and Advance Guard Exercises – 2 October 1942’, p. 4. ‘The New Battle Drill: A Conquest of Tradition in Training’, The Times (Tuesday, November 25, 1941), p. 5. ‘Realism in Training: New Methods at a Battle School’, The Times (Monday, April 27, 1942), p. 2. IWM 72/14/1 Papers of Brigadier H. D. K. Money, ‘Lessons from Training Camps and Advance Guard Exercises – 2 October 1942’, p. 1. PRO WO 169/5007 War Diary, 6th Battalion Durham Light Infantry, January – April 1942. ‘Realism in Training’, p. 2. ‘The New Battle Drill’, p. 5. Armour, Total War Training, p. 36. Tom Wintringham, ‘The Home Guard Can Fight’, Picture Post, Vol. 8, No. 12 (September 21, 1940). Timothy Harrison Place, Military Training in the British Army, 1940 – 44: From Dunkirk to D-Day (London, 2000), p. 57. Paul Fussell, Wartime: Understanding and Behaviour in the Second World War (New York, 1989), p. 120. Do you know where I could find out where these divisional battle schools were located? Or where I could get the articles from The Times that you reference? Thanks.